Many pundits have been saying that Los Angeles Mayor Antonio Villaraigosa has been a disappointment. Sure, he has the challenge of serving in very dismal economic times, but he really hasn’t lived up to the hype, even setting aside his personal drama. Villar looks good in a suit, speaks well when scripted, and does have that mega watt smile, but at the end of the day, people expect more — they want substantive leadership and real solutions. 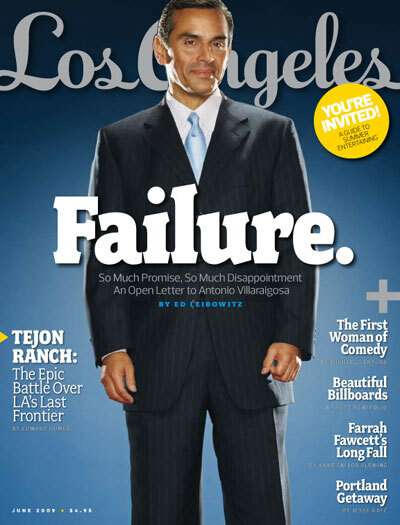 Los Angeles Magazine has given Mayor Villaraigosa the benefit of the doubt before, noting his popularity and quest to be more than a ‘telegenic figurehead.’ In June’s Los Angeles Magazine, writer Ed Leibowitz writes an open letter to the Mayor urging him to put his political ambitions for the governorship on hold and to give his current job his all. According to LA Oberved, the online version of the article will go up on Monday. Keep an eye out for it, and let us know what you think. I am of the opinion that Villaraigosa should not run for governor. Poor guy, I feel sorry for him. Your tax dollars at work…it’s difficult in this time and age to make so many promises and tell so many lies and not be held accountable for those actions. To add siestas, flying all over the world, and profiteering at the public’s expense to that list of attributes only compounds the damage he has done to the Angeleno citizen. Arnold should be on the cover of that magazine. I wish the media would tell him not to run for the Senate. That’s how the media work, so you shouldn’t take everything a small group of ‘reporters’ say as gospel. The problem with narcissm, is that that they do not know they are narcassist…. Totally appropriate letter and cover for “Los Angeles” magazine. I like how they’re giving Tony his due because he hasn’t given us much in return. Here is a man who’s extremely low character equally reflects his performance as Mayor of Los Angeles. The City of Los Angeles deserves much better than this pond scum. Pond scum is too nice a word to describe this man. That word should be used to describe all the public thieves he stacked into the Los Angeles Planning Commission. Incompetent or inept would be more descriptive of Villaraigosa’s managerial abilities. And since the content of his character resembles Fabian Nunez and Jose Huizar’s that’s as low as a human being can get. LA has burned twice, and not that long ago the LAPD was beating the hell out of innocent people all over the place, and not being held accountable. Those days are long gone. So, no he is not a failure. Many of the problems that affect the city are beyond the mayor’s control. I don’t want to be mean, but as long as the immigration problem is unresolved, LA will have problems. I think you and many of the people who post here are of extremely low character. Why do you think this place gets so little traffic? The non-stop negativity and baseless allegations are overwhelming. The crabs in the bucket syndrome is alive and well. Special Order 40 is not beyond the Mayor Villar’s control. He has help to extend the practice of a de facto sanctuary city. The immigration problem is unresolved due to no enforcement of immigration law. Villar has participated in that by his lobbying of Washington in favor of illegal immigrants rights. I don’t think Villaraigosa is interested in dating you. But he thanks you for all your efforts to recreate him in your image. That’s the responsibility of the federal government. The city doesn’t have the authority, much less the money to round up millions of people. It’s not the mayor’s issue. It’s now Obama’s issue. And eliminating special order 40 would just create more crime, as people would not trust the police. Furthermore, it would lead to racial profiling. If illegal immigrants are caught committing crimes, they are jailed like everybody else. They don’t get special treatment. The fact is that the federal government has to deal with this issue, but they won’t. It’s a wedge issue that just keeps on giving. The immigration problem can be easily solved by enforcing the laws already in the books. LA is in shambles because frankly Mayor Villar is just not qualified. He probably lacks critical and analytical thinking capabilities as evident by his numerous atttempts to pass the bar. He’s a man who has difficulties in his personal life, and thats reflective on his current handling of his duties. Further, he spends more time out Los Angeles than he should for unrelated issues. Is he still thinking of running for Governor?